Home / Shop / Series / Trade Issues, Policies and Laws / Subsidies in the US and the EU: Control or Free Provision? 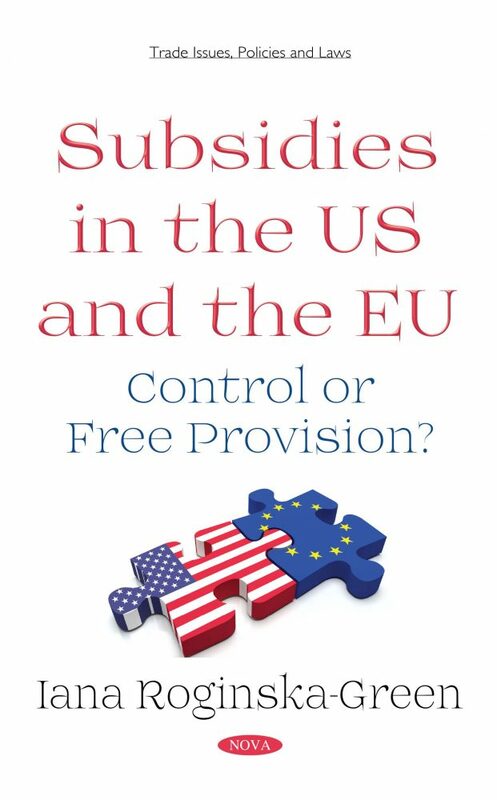 This book represents a historical, political and legal overview of the US and EU systems of provision for corporate subsidies and their control. Differences, one might think, are easy to imagine, while similarities may not be as apparent. Over the last sixty years, the European project has developed a sophisticated legal regime for the monitoring and control of corporate subsidies (legal term used is “state aid”), whereas the United States has no systems that come close to any such organized effort. However, the lack of any regulatory framework in the United States cannot be explained by the absence of subsidies and corporate support in the economy. State aids or corporate subsidies are provided at every level – federal, state, and local. There are many historic and recent cases of the provision of such subsidies in the US and how they influenced the economy of the country. However, what still remains similar with the EU system is the effect on competition these state interventions have and the consequences for the final consumers and taxpayers. It is unclear whether the United States will ever move in the direction that Europe has taken from a regulatory point of view. What is indisputable, however, is that the European experience provides a rich record of the many forms that state aids might take, how they affect competition at various levels of the market, and what kinds of remedial measures seem appropriate. In that sense, Americans might learn from the Europeans and try to develop this area of the law. The European experience offers many useful lessons for the rest of the world. The overview and assessment of this book will be a good instrument for the US audience – from policymakers to academia – to see how both systems work and if there is a need and possibility for the US to apply the same regulatory regime. Chapter 7. Is it Possible to Introduce a European Union Style System of State Aid Control and Monitoring in the United States? The book is aimed at a wide audience of those with an actual or potential interest in a single guidance publication on corporate state support law and policy in the US and EU – its history, overview, current situation, case examples and assessment. Thus, it is intended to be useful for US officials and for lawyers, officials and other practitioners and academia throughout the EU and the United States. The primary market of the book: US practitioners and officials; academia; judiciary; legal consultancies. The secondary market: officials, practitioners and academia from EU countries and Masters/LLM/PhD students.